Jointace Omega-3 provides pharmaceutical grade marine oil, with a 50:50 ratio of Omega-3 fish oil and Cod Liver oil. The fish oil is selected from a clean deep sea environment. Jointace Omega-3 soft gel capsules have a natural orange oil OdourMask™ to prevent any unpleasant aftertaste. 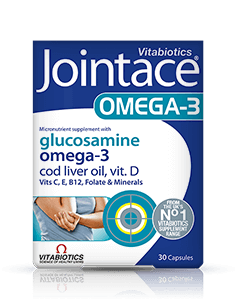 Along with trace minerals, Jointace Omega-3 provides Glucosamine present in the preferred potassium form. Jointace Omega-3 is available in the UK from Boots, Superdrug, Tesco, Waitrose, supermarkets and pharmacies, health stores including Holland and Barrett. Alternatively you can order online here. Capsule Shell (Pharmaceutical Grade Gelatin [Bovine Source], Humectant: Glycerin, Natural Orange Flavouring, Water, Natural Source Colours [Titanium Dioxide, Copper Chlorophyll]), Glucosamine Sulphate (as Potassium Chloride) (from Crustacean) USP†, Pure Cod Liver Oil (from Fish), Omega-3 Fish Oil (from Fish) [Omega-3 Acid Ethyl Esters, Mixed Tocopherols (Vitamin E), Sunflower Oil], Vitamin E (DL-Alpha Tocophery Acetate), Thickener: Glyceryl Monostearate, Vitamin C (Ascorbic Acid), Natural Orange Oil, Zinc Sulphate, Vitamin B12 (Cyanocobalamin [Carriers: Trisodium Citrate, Citric Acid, Maltodextrin]), Lecithin (From Soya), Manganese Sulphate, Copper Sulphate, Sodium Borate, Vitamin D3 (Cholecalciferol [Carriers: Medium Chain Triglycerides, Antioxidant: DL-Alpha Tocopherol]), Folic Acid (as Pteroylmonoglutamic Acid), Sodium Selenite. Allergy Advice: For allergens see ingredients in bold. TWO CAPSULES PER DAY WITH YOUR MAIN MEAL. Swallow with water or a cold drink. Not to be chewed. Do not exceed the recommended intake. 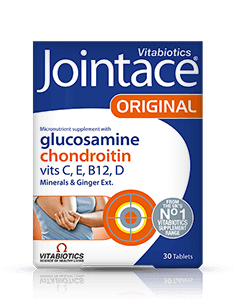 Jointace Omega-3 contains glucosamine sourced from natural chitin. Diabetics and those taking anti-coagulants (blood thinners) should consult their doctor before using this product. This formula replaces other Jointace supplements. A regular intake is recommended. Jointace Omega-3 is recommended with a balanced diet, rich in fish oil. 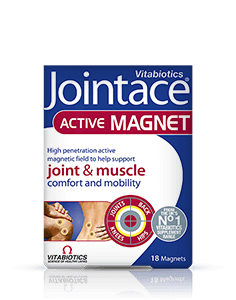 Part of the Jointace range, which includes Jointace Tablets, Gel, Patch, Fizz & Magnets. Food supplements must not replace a varied and balanced diet and a healthy lifestyle. As with other food supplements, consult your doctor or pharmacist before using if you are under medical supervision, pregnant, breast-feeding, have epilepsy, suffer from food allergies, or are allergic to any of the ingredients. Not suitable for children. Allergy Advice: For allergens, see ingredients in bold. Made in a site that may handle nuts. Store below 25°C in a dry place, out of sight and reach of children. Why have Jointace Omega-3 capsules been developed? Can Jointace Omega-3 capsules be used simultaneously with medicines? How many capsules does one pack of Jointace Omega-3 contain? How and when should Jointace Omega-3 capsules be used? Are there any undesired effects whilst taking Jointace Omega-3 capsules? For how long should Jointace Omega-3 be used? Is Jointace Omega-3 suitable for vegetarians? "Hello. I just wanted to let you know that your Jointace Gel is the best! I am so very thankful and impressed with it. Can't rate it high enough. Thank you"
"I discovered Jointace after a family recommendation and have been taking it regularly for two months. Thank you Vitabiotics for a brilliant product! I've been recommending it to all my friends." "Having ran the Mad Dog 10k in Southport yesterday I found one of your Jointace Gel samples in my goodie bag. I tried it on my aching thighs and was pleasantly surprised at how fast it had an effect (10-15 mins) that with its amazing smell has prompted me to place an order today"
"Been taking Jointace Max now for three months and there is a considerable improvement. Will definitely continue to use this product." "I’m very addicted to the gym, especially jogging on the treadmill , despite the scientific claims that being overweight and running that might hurt the knees and joints of the runner. After months of jogging and running, almost 4-5 times a week, and due to my age, 38 years old, I felt my knees and joints are exhausted. 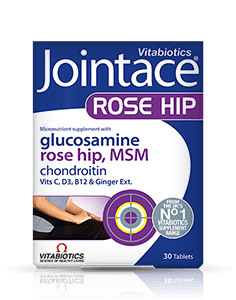 I went to a doctor to check on my knees, and he prescribed Jointace Collagen tablet, after a couple of months of using Jointace Collagen tablets every day , I feel now my joints and knees are much stronger. Most importantly I still keep running with no worries. Thank you so much for this amazing product , I hope others get benefits from my experience. " "All my family use jointace gel, including my 90 year old mother, this is a great product. Also find the website very easy to use and like the reward points." 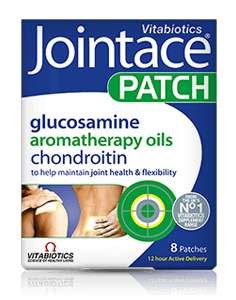 "Jointace patches are keeping me active. I live in the French alps and despite old knees, I'm 76, I still ski tour , cycle in the summer, and lead and active life. The patches work!! I order online and they are with me in 3 to 4 days." "Dear Sirs, I'm really impressed with Jointace Collagen. I was diagnosed with Ehlers Danlos syndrome by a rheumatologist last year having suffered from severe pains and cramps in several quite hypermobile joints for a number of years. 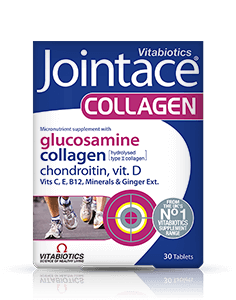 I started taking Jointace Collagen in March 2013 and many of the symptoms have reduced significantly. Very many thanks, Ben Hargreaves"
"I have been using Jointace Gel for years and it's brilliant. I recommend it to friends; It's a fantastic product - thank you." Middlesex County over 50 squash team member, British Amateur (Jesters Trophy) over 45 runner up (2008 and 2009), and competitor at recent World Masters event in Cologne." "On my recent visit to the UK, I was introduced to Jointace for my knees. After a few days I could climb many castles while over there and will continue to use Jointace. I am Rock and Rolling again! Thank you Vitabiotics." "I have always taken cod liver oil but 3 weeks ago i bought Jointace and within 2 weeks to my amazement, my knees felt great .I went running 4 times this week with no problems .I couldn’t believe how well it worked. I took 2 tablets every day on till the first box was finished (30 tablets). I will continue to take this product also because my joints feel good even after all the exercise (football, boxing, running, cycling and weight lifting).I can’t tell you how pleased and how happy i am with this product ,all i can say is THANK YOU!" 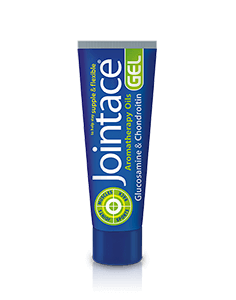 "I have been using Jointace Aromatic Massage Gel on both knees for over a year, and it has been great . Two weeks ago i felt my circulation was affected. I rubbed my feet, after my knees ... to my delight it felt good and I am now rubbing in a small amount of Aromatic Gel twice a day. The benefit has continued and I am delighted! " "Ive been taking Jointace capsules and Gel for over two weeks and my knees feel great. Ive been doing 8 mile walks with a sense of freedom in my knee joints. Bizarre! Do at least try it for a month; this stuff works." "I think Jointace gel is a great product that works. Lovely smell and nice texture to rub in, not runny like other products. Hard to find in shops. Will buy in bulk now i have found website and also try some other products too!" "I only found out about the product by chance after finding a leaflet in my GP'S waiting room and I went and ordered some, through my local chemist. I find the gel great and it really relaxes especially after having a warm bath. Its nice to have a good nights sleep and 75mls goes a long way. I would recommend it to anyone. 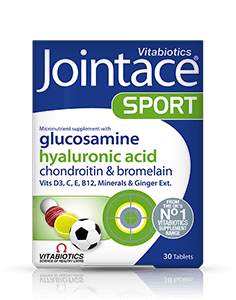 Also a lot cheaper by buying online at www.vitabiotics.com"
"My son gave me a sachet of the Jointace Gel. Well, I have tried the Gel and have had great benefit. I am now going to purchase a tube of the Jointace Gel and use it regularly. An excellent product." "Dear Professor Beckett, At the young age of 73 years, I recently ran the Great North Run, to raise much needed funds for the dental charity, Dentaid. Now retired, I am the present President of the Dental Practitioners Association. In our 'Goodie bag', was a sample of your gel, which I applied -more in hope than expectation! to my surprise (and pleasure) I had almost immediate benefit. Once home, I had to order the gel from Boots but twice daily application, coupled with exercise leaves me able to continue preparations for another race. You have my permission to use this letter in any promotion. Yours sincerely, B Lux. LDS.RCS"
"Having joined my husband in Newcastle for the Great North run,I discovered the sachet of gel in his bag. I decided to try the gel.I cannot believe how good I felt and how quickly it worked.I have stocked up and will be recommending to others. Thank you"
"Very impressed. I have tried other products but nothing gave noticable results quick enough so i gave up. However a combination of Fizz and Omega 3 capsules have made a huge difference(after 1 month). Highly recommended." "Jointace Gel has proved very efficient for my husband and myself. We saw it recommended in a newspaper and it has lived up to expectation." "I already take Jointace Fizz but have been unable to get the gel anywhere. I have had had two knee operations in the last year and find that Jointace is helping whereby other products have failed." "Ran 32 miles on my bad knees (strapped up) at the weekend in the UK Peak District. Had difficulty kicking earlier in the week in my martial arts classes. Took some last night , woke up after only 4.5 hrs of sleep and they feel GREAT !!! !Wow - I am amazed (and no, I don't get commission !). Was getting down thinking at 31, my fell running and high kicking days were over and it got me down. I'm buying this regularly from now on (hey Vitabiotics - I'll be happy to praise this in public as it's cheered me up no end)." "Fantastic results. 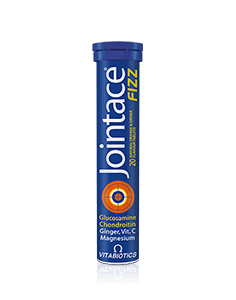 Have been taking Jointace Fizz for the last 10 days." Always read the product directions before use. Do not exceed the recommended intake. As with other food supplements seek professional advice before using if you are pregnant, breastfeeding or suffer from food allergies. 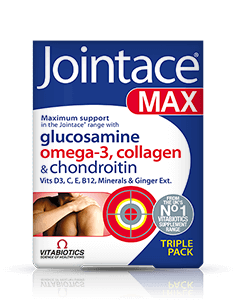 Jointace Omega-3 is a food supplement that contains glucosamine sourced from natural chitin. Do not take if you are allergic to fish or shellfish. Consult your doctor or pharmacist before using this product if you have an underlying medical condition (e.g. epilepsy, hyperthyroidism), or if on medication. Diabetics and those using blood thinning medication should consult their doctor before using this product. Vitamin supplements are not intended to treat or prevent any disease. Food supplements must not replace a balanced and varied diet, and a healthy lifestyle.